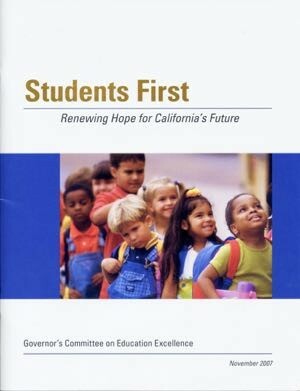 In 2005, Governor Arnold Schwarzenegger appointed 18 members to the "Committee on Education Excellence." The committee, led by Ted Mitchell, was charged with formulating education policy recommendations in response to Getting Down to Facts, a multi-year coordinated research effort to describe the systemic challenges of public K-12 education in the state of California. The unanimous report of the committee included extensive, detailed policy recommendations, some of which were subsequently implemented. Of these, one of the most important was to extensively redesign the state's system for allocating funds to school districts. The Local Control Funding Formula (LCFF), which allocates funds to districts based on the definable needs of students, shows the influence of the committee's work. The committee also unanimously recommended significant increases in California's funding for education. This recommendation was poorly timed; the committee released its report in early 2008 just as the US stock market was collapsing. 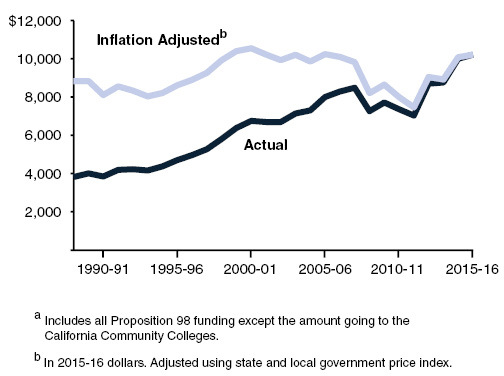 California's per-student funding for K-12 education was not expanded - it was cut, and did not recover even to its 2008 level until 2015-16. "The degree of consensus was surprising, even though members ranged from conservative Hoover Institution economist Eric Hanushek to ACLU legal director Mark Rosenbaum. All agreed that more money was needed but must be tied to reforms, including new ways to train, evaluate and pay teachers and administrators; a new evaluation system that rewards as well as sanctions schools; more extensive data on student performance, and more district control over school management and spending." The findings of a massive coordinated research effort known as "Getting Down to Facts II" were unveiled in September 2018. Serving on this committee was a privilege and a lesson in how people with very different points of view can work together.